The Tathāgatagarbha Sūtra is an influential and doctrinally striking Mahāyāna Buddhist scripture which treats of the existence of the "Tathāgatagarbha" (Buddha-Matrix, Buddha-Embryo, Buddha-Essence, lit. "the womb of the thus-come-one") within all sentient creatures. The Buddha reveals how inside each person's being there exists a great Buddhic "treasure that is eternal and unchanging". This is no less than the indwelling Buddha himself. Anthony Barber associates the development of the Tathagātagarbha Sūtra with the Mahāsāṃghika sect of Buddhism, and concludes that the Mahāsāṃghikas of the Āndhra region (i.e. the Caitika schools) were responsible for the inception of the Tathāgatagarbha doctrine. The Tathagātagarbha Sūtra is considered "the earliest expression of this [the tathāgatagarbha doctrine] and the term tathāgatagarbha itself seems to have been coined in this very sutra." The text is no longer extant in its language of origin, but is preserved in two Tibetan and two Chinese translations. the canonical Tibetan translation (around 800 CE). Buddhabhadras version was translated into English by Grosnick in 1995 and the Tibetan version was translated by Zimmermann in 2002.
comparing it to (2) honey protected by bees, (3) kernels enclosed by their husks, (4) a gold nugget in excrement, (5) a hidden treasure beneath the house, (6) a sprout in the seed becoming a huge tree, (7) a tathāgata image wrapped in rotten rags, (8) a cakravartin in the womb of a despised, orphan woman and (9) a golden figure within a burned clay mold. ... as Alex Wayman, Michael Zimmermann, and I have noted, the original meaning of the term was that one is "already" or primordially awakened. For example, the Tathagatagarbha sutra illuminates the matter metaphorically this way: "inside a casting mold there is perfectly formed Buddha; the ignorant see the filth of the mold but the wise know that the Buddha is within." The Tathagātagarbha Sūtra constitutes one of a number of Tathāgatagarbha or Buddha-nature sutras (including the Mahāyāna Mahāparinirvāṇa Sūtra, the Śrīmālādevī Siṃhanāda Sūtra, the Angulimaliya Sutra, and the Anunatva-Apurnatva-Nirdesa) which unequivocally declare the reality of an Awakened Essence within each being. 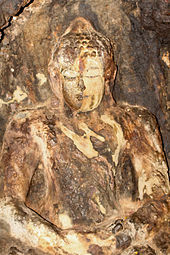 According to some scholars, the Tathāgatagarbha does not represent a substantial self (ātman); rather, it is a positive language expression of emptiness (śūnyatā) and represents the potentiality to realize Buddhahood through Buddhist practices; the intention of the teaching of Tathāgatagarbha is Soteriology rather than theoretical. This interpretation is contentious. Not all scholars share this view. Michael Zimmermann, a specialist on the Tathagātagarbha Sūtra, writes for instance: "the existence of an eternal, imperishable self, that is, buddhahood, is definitely the basic point of the Tathagatagarbha Sutra. Buddhahood is thus taught to be the timeless, virtue-filled Real (although as yet unrecognised as such by the deluded being), present inside the mind of every sentient being from the beginningless beginning. Its disclosure to direct perception, however, depends on inner spiritual purification and purgation of the superficial obscurations which conceal it from view. ^ Padma 2008, p. 155-156. ^ Zimmermann 1999, p. 144. ^ Zimmermann 1999, p. 145. ^ Zimmermann 2002, p. 16. ^ Zimmermann 2002, pp. 93-162. ^ Grosnick 1995, pp. 92-106. ^ Zimmermann 1999, p. 149. ^ Zimmermann 1999, p. 150. ^ Padma 2008, p. 152. ^ King 1997, pp. 174-192. ^ Zimmermann 2002, p. 82. ^ Zimmermann 2002, p. 64. ^ Zimmermann 2002, p. 81. ^ Hubbard 2001, pp. 99-100.